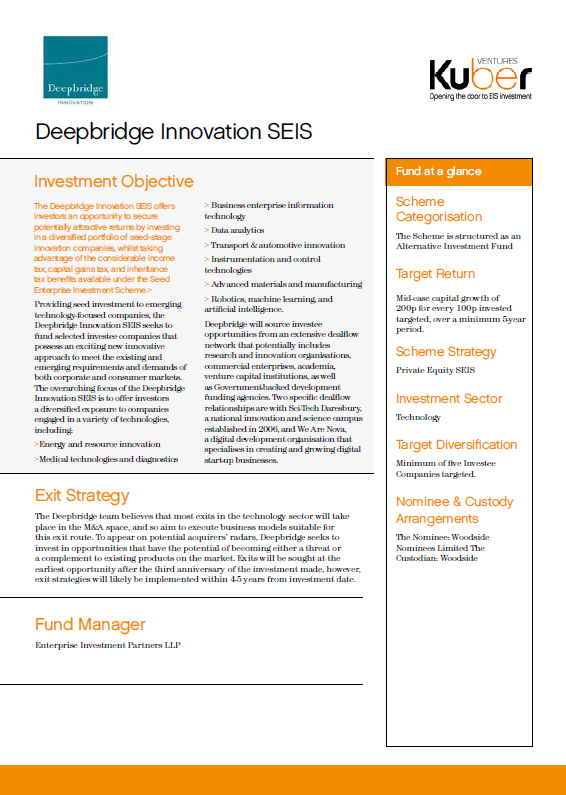 The Deepbridge Innovation SEIS offers investors an opportunity to secure potentially attractive returns by investing in a diversified portfolio of seed-stage innovation companies, whilst taking advantage of the considerable income tax, capital gains tax, and inheritance tax benefits available under the Seed Enterprise Investment Scheme. Robotics, machine learning, and artificial intelligence. Deepbridge will source investee opportunities from an extensive dealflow network that potentially includes research and innovation organisations, commercial enterprises, academia, venture capital institutions, as well as Government-backed development funding agencies. Two specific dealflow relationships are with Sci-Tech Daresbury, a national innovation and science campus established in 2006, and We Are Nova, a digital development organisation that specialises in creating and growing digital start-up businesses. The Deepbridge team believes that most exits in the technology sector will take place in the M&A space, and so aim to execute business models suitable for this exit route. To appear on potential acquirers’ radars, Deepbridge seeks to invest in opportunities that have the potential of becoming either a threat or a complement to existing products on the market. Exits will be sought at the earliest opportunity after the third anniversary of the investment made, however, exit strategies will likely be implemented within 4-5 years from investment date. An annual maintenance charge of 2% of the funds invested in an Investee Company will be paid to the Investment Adviser by each Investee Company on an annual basis. From this fee, the Investment Adviser will pay certain operating costs of the Investee Company including the ongoing monitoring of each Investee Company. The Investment Adviser will charge each Investee Company a dealing fee of 0.65% on the sale and purchase of shares, and a Custody Administration fee of 0.50% p.a. for the provision of custody services. The Custodian shall receive these fees for their respective services, payable by the Manager, upon presentation of invoice to the Manager or Investment Adviser. 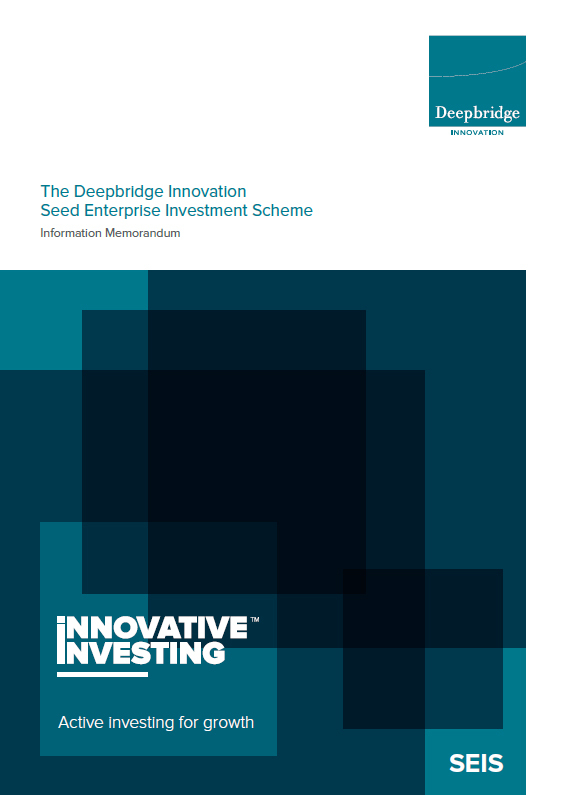 The Investment Adviser will receive an incentive fee of 20% of the amount of cumulative total cash returned to the Deepbridge EIS by each Investee Company in excess of the amount of the funds invested in the respective Investee Company. 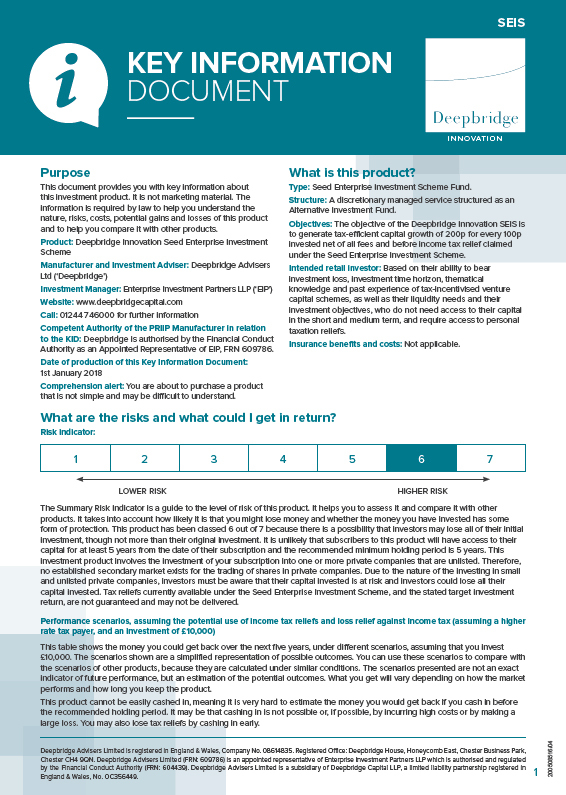 For clariﬁcation, once the Investor has received in cash the ﬁrst 150 pence per 100 pence invested (ignoring any tax relief and representing a 50% Hurdle Rate on funds invested), any additional distributable cash will be paid as to 80% to the Investor and 20% to the Investment Adviser. This is intended to align the interests of the Investment Adviser with those of the Investors and the incentive fee will therefore only become payable if the total cash returned to Investors, per Investee Company, exceeds the amount of initial capital invested by 20% or more. 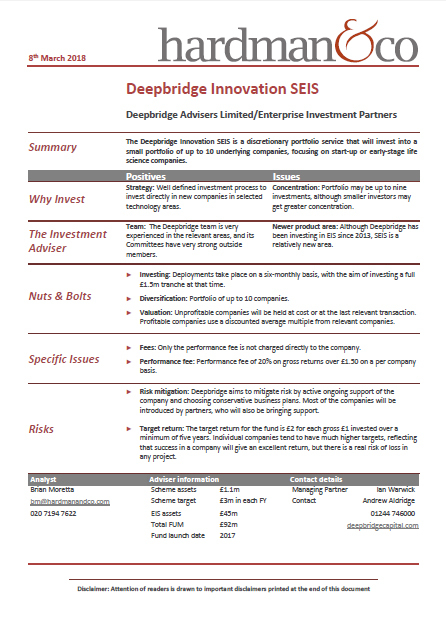 The Investment Adviser reserves the right to levy additional fees to the Investee Company to meet any costs relating to investor marketing, additional fundraising and administration, custody and dealing services, as well as those specific legal and compliance services provided not covered by the Annual Maintenance Charge. 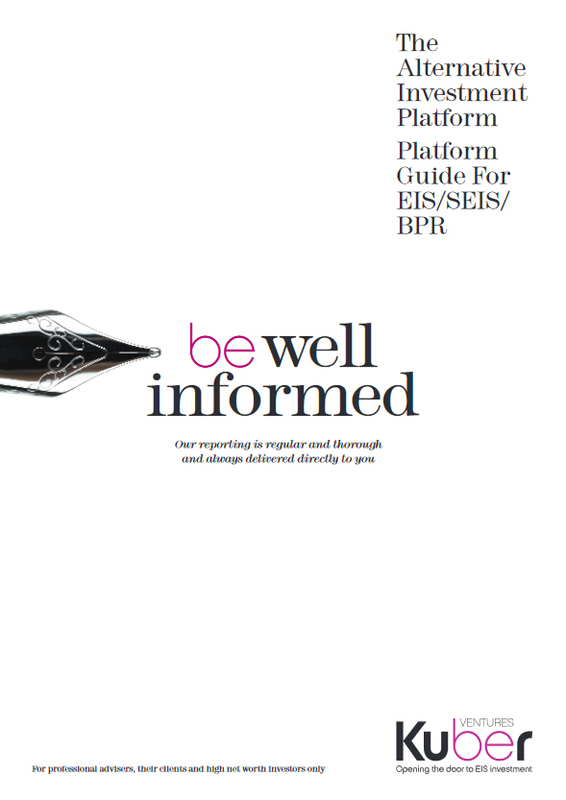 Such fees will be reported to the Investment Manager and investor on a regular basis. In certain instances, the Investment Adviser may also seek to take shares, options or warrants in the Investee Companies either in lieu of any of the above charges or fees in addition and in line with standard industry practice. All fees, costs and expenses levied on the investee companies are stated excluding any VAT which may also be charged where applicable. Kuber receives a fundraising fee of 1.0% from the manager. Kuber will return this fee to Investors by applying it to their Subscription amount thereby increasing their investment. 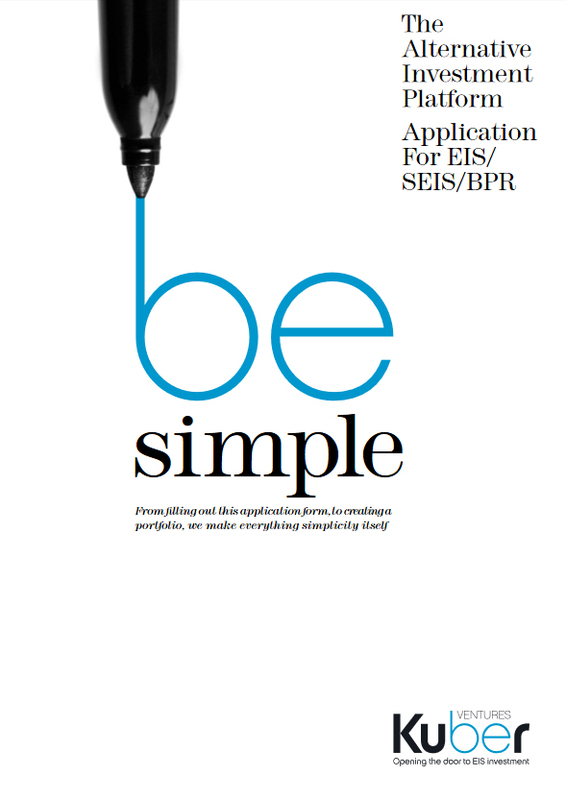 Mid-case capital growth of 200p for every 100p invested targeted, over a minimum 5-year period. Minimum of five Investee Companies targeted.